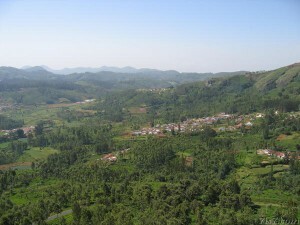 Coonoor hill town is 17km from Ooty.Its natural beauty,singing birds,pleasing sounds of the falls attract tourists every year.In 1835 Nilgiri tea plantations started here as a commercial venture.It has earned a fame for itself.Coonor is also considered to be a better health resort than Ooty for its more temperate weather.The market place is in lower coonoor and the bus stand and the railway station are situated in the upper coonoor.The Seam’s Park, established here in 1878, as fine lawns and a collection of rare plants and trees picturesquely located along a steep slop. Scenic waterfalls-Law’s Falls and St. Catherine Falls and fine vantage points with breathtaking views and amusing names like Lamb’s Rock, Dolphin’s Nose and Lady Canning’s Seat are popular picnic spot. This entry was posted in Coornoor, Tamil Nadu. Bookmark the permalink.